The seed catalogues have begun to arrive. They slip through the mail slot, land in piles in the hall, and like a scene from Privet Drive, they come unabated, incessantly, and I stack and read and stack again—flower glossies, full-colour vegetable books, herb lists, booklets, pamphlets, flyers. Will this be the year for skirret and salsify? Can I fit six varieties of sweet peas or more? There’s a new Scabiosa, an annual Euphorbia, and a ‘Sahara’ Rudbeckia I must try. How does one decide? The trouble with seed catalogues: They push us into the paradox of choice. Why is the affluent twenty-year-old thinking of ‘traveling in Europe’ a little miserable when they have all the freedom in the world? Why do we suddenly seize up when presented with ten different styles of jeans? We can’t choose. We grow unhappy when given too much choice. Gardening maximizers be warned: ’tis the season for indoor angst. So when faced with abundance (at $3 a packet, seeds lead to largesse), my seed strategy is this: I write down everything I want. I fill in forms. Really commit, in ink. Then I forget about the list for a while, look at it again, and call the company to speak to a real person who does all the work of tallying up and shipping, tells me my total, waits for me to balk, and then I pare back my order with the benefit of their computer and my parsimonious shame. Seeds are a BIG subject, but here’s one guiding principle to follow as the catalogues roll in: only order from companies or growers that have climates similar to own. My definition of ‘similar’ is self-indulgent, of course: I use Seedaholic from Ireland, Floret from Washington, Owl’s Acres, Chiltern and Sarah Raven from England for flowers, and West Coast Seeds for salad greens. Locally, I buy seeds from Saltspring Seeds and Metchosin Farm. I try—desperately at times—to avoid heirloom seeds from exotic locations: they just aren’t adapted to our environment and despite worthy urges to support open-pollinated varieties and genetic diversity, your money is better spent by donation to a botanic garden, seed bank or heirloom protection project. Want to grow an ancient grain or groovy gourd this year? Resist unless you can find the seed locally. Read packets. Investigate companies. Old open-pollinated varieties of seed are the most stable (true to type), and if they come from a maritime climate like ours, you’ll increase your chance of success. But if you do succumb and buy too much seed this spring, remember you’ve got a few years to use what you didn’t sow. If kept cool and dry, seeds will last a few years, at least. So dig out that shoebox from last year and place it prominently next to catalogues—see what you have saved before you spend. A friend dropped by today, and she’s in a slump. It’s not my place to detail her woes, but because I’ve been reading the biography of an amazing gardener and florist it led me to think how all our small dramas play out over time, acted upon life’s large stage. The biography is titled The Surprising Life of Constance Spry, and is written by Sue Shepard. 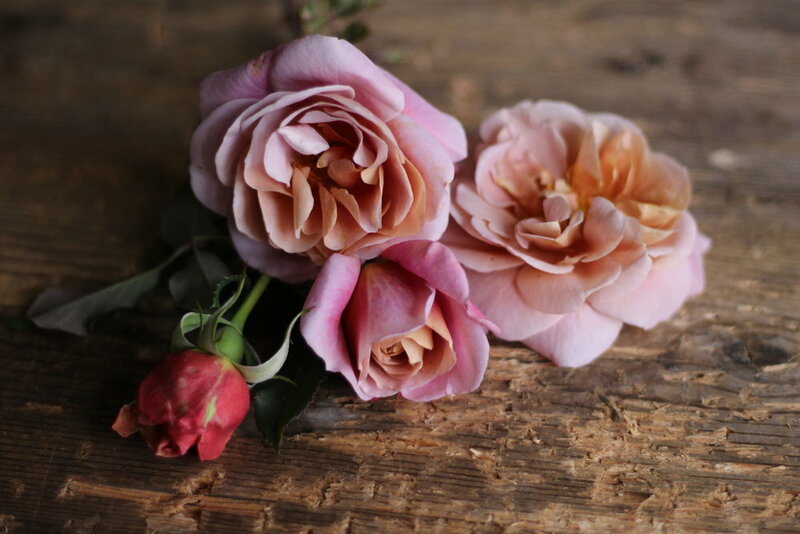 Spry is a name many gardeners will know given David Austin named his first English rose introduction after her (Spry had led the cultivation of French and old roses in Britain in the 30s). She revolutionized flower arranging in England and America, eschewing the stiff wired arrangements of the time for more relaxed designs incorporating native plants, fruits and seeds. She broke more rules than she created and her work became wildly fashionable in London between the wars and beyond. Her lush, loose aesthetic still influences contemporary florists today. From mine manager’s wife to florist for the coronation of Queen Elizabeth II, Spry truly did have a surprising life. But for me, her passion for plants is the most important part. An artist’s words. This past summer, partially as a result of this column, I have found Spry’s release in flowers, in growing and creating arrangements that bring happiness to others. It’s not easy to both grow and arrange, and I’m still learning. It takes patience, an eye for colour, shape, and line, all of which need to be practiced, cultivated, over time. One becomes highly conscious of seasonality, the ephemeral nature of flowers, and how in the pursuit of beauty, we must again and again let go. In 2004, the Design Museum of London held an exhibition of Spry’s work, one which proved controversial and led to a museum director’s resignation. (For him, floral styling didn’t count as design, rather as ‘decorative art’). Fitting this bias, given in Spry’s time, women were educated in how to ‘do’ the flowers. Thankfully today, there’s a resurgence in the appreciation of the domestic arts and the use of local flowers, and unlike the museum director, I think it’s important to look at such crafts as art. We all live our lives on a stage of space. And how we adorn that space, what colours we need to feel happy, what plants speak to memories or desires, are fundamental to happiness and health. I say, start with flowers. I hate telling people what to do. Or rather, I hate myself for telling people what to do, which puts me in a tricky place as garden columnist, because I feel as if I’m meant to prescribe, issue directives, offer advice, and yet when it comes to gardening, I’m a firm believer in cultivating intuition. Chances are we both know more about our respective gardens than either of us care to admit. Our inadequacies, we itemize. Apologies, abound. Here’s what I know, right now, as I sit typing: I know the slugs are stirring. It’s dusk and they are crawling up the seedling trays in my poly-tunnel, sliming their way to an evening’s feast. The penstemons I moved today are most likely in shock: I must remember to water them tomorrow. The garlic scapes need to be picked to drive the plant’s energy into the bulb. The peonies have yet to be corralled despite being swollen in bud, and the roses need protection because the bamboo/netting combo I rigged up is a pathetic excuse for a barricade and the deer like David Austin’s scented roses as much as I do. Dandelions are ballooning disastrously beside the compost, whilst the cursed Alstromeria is sending it’s brittle fingers into every impossible corner of the border. I should have watered the south facing-edge of my driveway, where I’ve planted some perennial Verbena which will need coddling before enduring summer’s drought. I’m at my desk and I know all of this. Maybe you’re standing in the kitchen, agreeing yes, there’s always a list, a great hierarchy of needs. Look out the window at your garden: It can be hard to see the forest for the trees. Still, every time you look, you learn. Success can come from simply paying attention. Case in point: the other day I noticed the new leaves of my Belle de Boskoop apple had curled. I’d been seeding French beans, but stretched open a reluctant apple leaf and found an aphid colony, happily being nurtured by ants (a fascinating instance of mutualism, whereby the ants eat the excreted honeydew from the aphids and assist with aphid survival). My instinct was to smoosh the aphids, and before long I was on the hunt, peeling back leaves, grabbing soap spray, settling in for the kill. A half an hour passed before I went back to the beans. Perhaps, you potter about the garden, trimming here and weeding there. That time you spend, close up and personal with your plants and your soil, allows you to really see, to understand what needs to be done. I should have heard of him sooner. I’ve been gardening for most of my adult life and have not one, but two decent-sized bookcases devoted to natural history and gardening. I have the usual field guides, garden guides and perennial guides, plus oodles of niche gardening books the likes of which are rarely if ever opened – Baskets from Nature’s Bounty, A Weaver’s Garden, and Chicken Gardening among them. I own books on shade and foliage and roses. Glossy photo books, diaries, and more ‘year-in-garden’ books than years I have left to read them. But I didn’t have Nichols. And I might have gone my entire life never owning a book by Beverley Nichols if it weren’t for the Oak Bay library. There I stood one drizzly January day and plucked a vintage-looking novel-sized hardcover from the gardening section. The title, apt to cheer anyone, was Merry Hall. The story, I learned from the back flap, was about an English bachelor restoring a Georgian manor and its garden in the late 1940s. I don’t know about you, but chances are if you’re reading a gardening column, you might have harboured just such a restoration fantasy. I certainly have. A walled kitchen garden? Deep rich soil left from annuals past? Don’t even get me started on laburnum walks, pools, potagers and pergolas. I snatched up the book. And the next in the series, and the next… until I needed to start on his earlier work with a copy of my own. I ordered Nichols’ book, Down the Garden Path, first published in 1932, from Ivy’s Bookshop and was at the shop within the hour of its arrival. Shirley had only just called and there I was, practically panting. I felt I had to explain myself. A lark? (A Nichols word if there ever was one!) I don’t really even know what lark looks like. Still: The ladies were aflutter. A hand-drawn aerial map of a garden unfolded before me. A kitchen garden, fields, an orchard and statuary – gardener’s Narnia. Down the Garden Path is the first book in Nichols’ thatched cottage trilogy after which 10 more books about homes and gardens follow, not to mention novels, mysteries, travel writing and more. If you have a new home or garden, read him. If you dream of one? Indulge. Nichols writes from another time and place, but his stories about becoming a gardener have kept his books in print for over 70 years. Thirty-five dollars later, I set off down the avenue with my hardcover, one that will undoubtedly lead to a very pretty little shelf if not a manor. This week, when I should really be home digging in the garden, I’ll be in England digging through used bookshops for more Nichols. Talk about being led down the garden path.